Persistent bad odours that no amount of cleaning, disinfecting or air fragrance can eradicate; can result in staff health issues and absenteeism. Bad odours are often caused by bacteria build up, which also poses health risks. The problem is exacerbated by shared facilities, poor ventilation and people who do not wash their hands properly. Air fragrances or disinfectants cannot control the spread of micro-organisms. In eight hours, a single bacterium can multiply over 17 million times. This not only causes a bad smell but can also affect the health of your workforce and visitors. 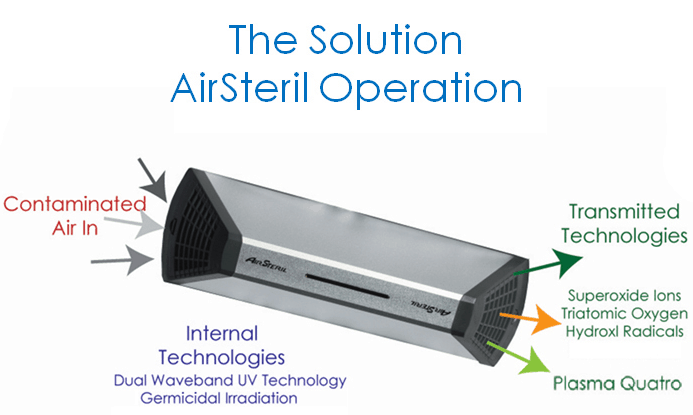 AirSteril completely eradicates bad smells and, more importantly, kills airborne and surface-bacteria, helping to reduce sickness in the workplace. An AirSteril unit is a smart addition to your cleaning service as it treats the root cause of the problem. Your unit works continuously 24 hours a day, 7 days a week and 365 days a year to purify the air so bad smells – and bacteria – do not return. AirSteril technology will save you time and money both from manual cleaning services and loss of productivity through staff absenteeism. How does Airsteril purify the air? In September 2009, the Health Protection Agency’s laboratories at Porton Down performed efficacy testing of the AirSteril MP20 Unit’s capability to reduce air and surface microbial contamination. The tests showed a reduction in airborne microorganisms of up to 98.11% within five minutes of exposure and a reduction of surface contamination up to 59.47% in one hour. The surface tests included MRSA. This shows that worst health-offenders – bacteria, fungi, mould, viruses, and Volatile Organic Compounds – are constantly eradicated by AirSteril, removing the opportunity for them to linger, grow and create an odour. We have different units to suit a variety of environments such as washrooms and healthcare locations as well as multi-purpose and mobile units. Read on to find out more. With every flush, toilets and urinals force faecal micro-organisms into the air. These settle on surfaces ready for the next user. The washroom units can be adjusted to deal with varying levels of contamination. There is an optional debris protection system for high pollution sites such as airports and train stations and a lower power washroom unit for use in smaller facilities. Eliminating odours in healthcare environments can be very difficult. Our Healthcare Unit is completely silent and operated by UV so even a light sleeper is not disturbed. The unique AirSteril thermal convection concept delivers purifying plasma to every nook and cranny of a room. It controls infection and odours by killing air-borne and surface micro-organisms including those trapped in curtains and carpets. 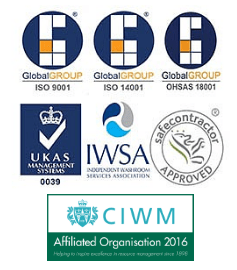 Offices, schools, and colleges experience many odour problems. Risks of cross infection are high in places where people congregate – even desks and keyboards can harbour harmful bacteria and viruses. Areas such as changing rooms and storage areas are often prone to mould and its associated health risks. The MF Range targets these problems by eliminating bacteria, mould, and odours. It is fan-driven and can easily be mounted on the ceiling or wall via a spur for continuous operation. It is suitable for use in areas that are frequently occupied and can be also be used as a portable unit. Unlike fogging, the MP unit does not leave damp surfaces or chemical residue and the area is suitable for occupation within a few minutes. It is designed for short-term decontamination in spaces up to 100m2. As a portable unit, it lends itself to tackling occasional contamination and odour problems. This unit could save you money in a hotel, for instance, as you can place the unit in a room where someone has smoked whilst you clean the other rooms. In around twenty minutes it will eliminate bacteria and neutralise room odours, eradicating the smell of cigarettes.